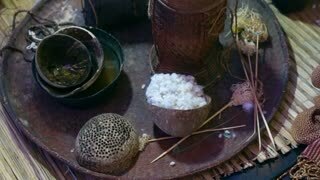 Search Results for "traditional weaving"
Old traditional wooden cotton weaving kit in ethnic Asian textile. Preparing cotton. 1950s: Woman smiles and wears a crown of candles. Old lady spins and weaves outdoor. Three women operate traditional weaving machine. BANG PA-IN. THAILAND - CIRCA NOV 2013: Local artisan spinning thread by hand in preparation for traditional weaving work. NAN, THAILAND - OCTOBER 2: An unidentified man showcases traditional weaving at the Noble House in Nan, Thailand on October 2, 2016. Weaving machine - Household weaving - use for weaving traditional Moroccan Carpets. Weaving loom for homemade and woman making wool thread in focus on back side. An overhead pan shot of weaver who is weaving traditional belt on a obsolete wooden weaving machine. 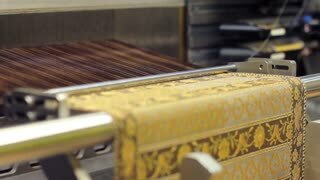 A close up shot of hands weaving traditional belt on a obsolete wooden weaving machine. A low angle shot of weaver who is weaving a traditional belt on a obsolete wooden weaving machine. A dolly out shot of weaver who is weaving a traditional belt on a obsolete wooden weaving machine. A hand-held medium shot of weaver who is weaving a traditional belt on a obsolete wooden weaving machine. 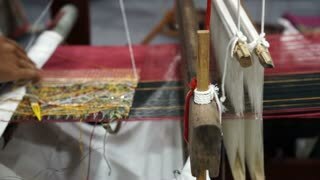 Close up of two woman weaving a straw mat in alternating colors using a traditional Asian technique; weaving a straw mat in a rhythm with each other. Chinese women are using traditional hand weaving. 1960s: Hands weave quickly. A woman sits on the ground and weaves. A woman wears traditional Peruvian clothing, she sits on the ground and weaves quickly. The face of a woman who sits and weaves. BAN NA - DECEMBER 16, 2016: Street scene with man weaving traditional bamboo basket and european woman watching in Ban Na village on december 16, 2016 in Ban Na, Laos.